You reap what you sow. There are many reasons behind the current polarised, divided Turkey, all of which can be traced to one man, Turkish President Recep Tayyip Erdogan. Indeed, he is not the only one to blame for Turkey’s sad state of affairs, but as the man who has held power for more than a decade, he is at the top of the list, with a huge gap between him and those behind him. In his quest to consolidate power, Erdogan’s ideologically motivated approach has planted the seeds of hatred, division and mistrust, with destructive consequences for Turkey. On 10 October, Turkey witnessed its worst terrorist attack in recent history, when more than 100 people were killed in twin suicide bombing attacks on a peace rally in the capital Ankara. Following the tragedy, Turkey’s leading writer Orhan Pamuk, the 2006 winner of the Nobel Prize for Literature, warned that the country could collapse into sectarian conflict, and blamed President Erdogan for the climate of insecurity, as illustrated by the brutal and deadly attacks in Ankara. Despite the shock and sadness throughout Turkey, President Erdogan only issued a short statement and did not give a speech to address the bereaved families or call for unity against terrorism. On her Twitter account, Cemile Bayraktar, a pro-government columnist, criticised CNN for interviewing Demirtas: “It is like Turkey state TV hosting Al-Qaeda,” Bayraktar wrote. Those comments sum up the mindset of Erdogan’s camp. For them, all their opponents are either traitors or terrorists. 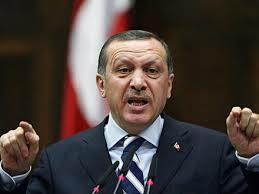 In his quest to fulfill his Ottoman dream, Erdogan has idolised all Islamists as good, innocent victims loyal to Turkey. As Josh Rogin and Eli Lake wrote, for years Erdogan’s government allowed fighters and weapons to flow into Syria for the jihadists fighting Bashar Al-Assad’s regime. Since 2014, reports have surfaced about cooperation between Turkey and the Al-Qaeda-affiliated Nusra Front. According to a McClatchy report, the kidnapping of a group of US-trained moderate Syrians moments after they entered Syria last August to confront the Islamic State was orchestrated by Turkish intelligence. Another recent report claims that Nusra fighters fled to Turkey as Russian choppers chased them in the Syrian region of West Idlib. Moreover, the link between Turkey and the Islamic State (IS) has started to emerge in Western outlets. Martin Chulov of The Guardian reported recently that a US-led raid on the compound housing IS’s “chief financial officer” produced evidence that Turkish officials dealt directly with ranking IS members. Later, Turkey claimed it would fight IS in Syria, but the main bulk of its strikes were against Kurdish militias, not IS. Both bombers who carried out the suicide attack on the peace rally in Ankara last again Saturday were said to be part of an ISIS cell from Adıyaman, a small city in the southeast of Turkey, where hundreds of young men, and sometimes women, are reported to have left to join Islamist militant groups in Syria. In fact, the Turkish police have named the brother of a suspected IS suicide bomber as one of the two bombers. The chain of events in Turkey, from the previous suicide attacks in Diyarbakır on 5 June and in Suruç on 20 July, to the latest in Ankara proves how President Erdogan still cannot see how some Islamists can be criminals, willing to kill peaceful civilians in cold blood. Zealous pro-Erdogan supporters view IS not as bad Islamists, but as agents of their enemies. The mindset inside the Erdogan clan cannot possibly see any Muslim Sunni men with beards as possible psychopathic murderers. In 2012, I posed the question: Is Turkey immune from radical Islamism? The Ankara bombing has offered a belated answer to my rhetorical question. Like other political Islamist ideologies, Erdogan’s ideology can be categorised into two major sub-elements: an irrational demonisation of opponents, which is bound together with an equally irrational psychological bond with other fellow Islamists that prohibits any ruthless crackdown on their criminal elements. Therefore, for Turkey, regardless of the results of the November election and the future of the country’s Kurdish population, radical Islamists are now embedded firmly inside Turkey and will not be easily purged. Erdogan’s most devastating shortcoming is his inability to understand the limitations of his own ideology. He has poisoned Turkish soil with a dangerous toxin that is difficult to eradicate and may haunt Turkey for years to come. This entry was posted in Islam, Middle East, Politics, Turkey. Bookmark the permalink. Erdogan’s Turkish intelligence link sounds too much like the Pakistani Inter-Service Intelligence (ISI) links to the Afpak Taliban. We have seen how that turned out.